Should Obama keep his BlackBerry? | BlackBerry Blast! BlackBerry Blast! > News > Should Obama keep his BlackBerry? Should Obama keep his BlackBerry? Everyone is talking about Barack Obama giving up his BlackBerry. The Secret Service thinks his BlackBerry is a security risk because it can be used to track his location, among other things. 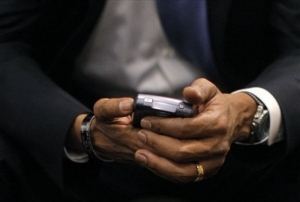 Obama will have to give up his addiction to his BlackBerry once he takes office. Will it make him turn back to cigarettes? We'll see. Peter Scheer of the San Francisco Chronicle sees it differently. He thinks Obama should keep his BlackBerry. "Obama should reject the advice of his aides and resume use of his BlackBerry for communications not requiring a high degree of security. A further recommendation: He should promise to make public all his communications on the BlackBerry going forward. Such a commitment would establish Obama's open-government credentials while earning him considerable capital with the news media. Moreover, the contrast with Capitol Hill secrecy could be used to put pressure on Congress to repeal its indefensible exemption from the FOIA. Shame can be a powerful incentive for reform." Perhaps he should, but he probably won't.